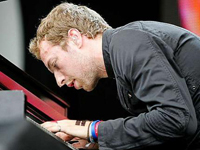 Christopher Anthony John Martin (born 2 March 1977) is the English lead singer, pianist, and occasional rhythm guitarist of the popular rock band Coldplay. He has a baritone voice and is known for his frequent use of falsetto. He is married to actress Gwyneth Paltrow. Martin attended Sherborne School, a boys’ independent school in Dorset, and is a First Class honours graduate of University College London where he captained the 2nd XI Hockey Team. As a solo artist, Martin has written songs for a variety of acts including Embrace (“Gravity”) and Jamelia (“See It in a Boy’s Eyes”). Martin has also collaborated with Ron Sexsmith, Faultline, The Streets, and Ian McCulloch. He also sang a part of the vocals for the Band Aid 20 single, “Do They Know It’s Christmas?” at the end of 2004. In 2005, Martin collaborated with Nelly Furtado on the track “All Good Things (Come to an End)”, for her 2006 album, Loose. The two were once rumoured to be a couple, after they both performed at Glastonbury in 2002. Furtado joked about the situation, saying that “Yeah, he’s my boyfriend — he just doesn’t know it yet”. Martin’s fascination with hip hop was shown in the summer of 2006 when he collaborated with rapper Jay-Z for the rapper’s comeback album Kingdom Come after the two met earlier in the year. Martin put some chords together for a song known as “Beach Chair” and sent them to Jay-Z who enlisted the help of hip hop producer Dr. Dre to add the drum line to complete the track. The song was performed on 27 September 2006 by the two during Jay-Z’s European tour at Royal Albert Hall. In 2007, Martin appeared on a track titled “Part of the Plan” for Swizz Beatz’ debut solo album One Man Band Man. Martin has also worked on a solo collaboration with Kanye West, with whom he shared an impromptu jam session during a 2006 concert at Abbey Road Studios. He performed the chorus on “Homecoming”, the fifth single from West’s Grammy Award-winning third album, Graduation. U2 has been another important influence on Martin both musically and politically, he wrote for Rolling Stone magazine’s 100 Greatest Artists of All Time the section on U2, saying: “I don’t buy weekend tickets to Ireland and hang out in front of their gates, but U2 are the only band whose entire catalog I know by heart. The first song on The Unforgettable Fire, “A Sort of Homecoming”, I know backward and forward — it’s so rousing, brilliant and beautiful. It’s one of the first songs I played to my unborn baby.” Martin also comments on Bono’s effect on his own charity and political efforts. Martin has been particularly outspoken on issues of fair trade and has done a great deal of campaigning for the charity Oxfam’s Make Trade Fair campaign. He personally traveled to Ghana and Haiti to study the effects of unfair trade practices. When performing, he usually has variations of “Make Trade Fair”, “MTF” or an equal sign written on the back of his left hand and the letters “MTF” can be seen emblazoned on his piano. He was a vocal critic of President George W. Bush and the war in Iraq. Martin was a strong supporter of Democratic presidential nominee John Kerry, most notably during his acceptance speech for the 2004 Grammy Awards Record of the Year, accepting for “Clocks”. On 4 July 2006, Chris was an actor featured in Johnny Cash’s music video for “God’s Gonna Cut You Down”.